Apple Cider Vinegar (ACV) is being hailed as one of the best drinks and is often considered as an essential health tonic. 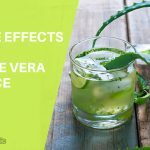 This miraculous drink is not only good for your health but is also extremely beneficial for your skin and hair too. 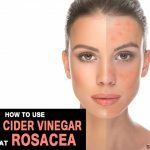 You will find numerous posts and blogs which have listed down the various advantages of using ACV and also how to use it. But did you know that apple cider vinegar also has certain side effects? Not many people are aware of this fact because they are blinded by its advantages. It is true that every product or treatment has its own set of advantages and disadvantages. Hence, it is very important for an individual to make sure that he/she is aware of both the pros and cons. 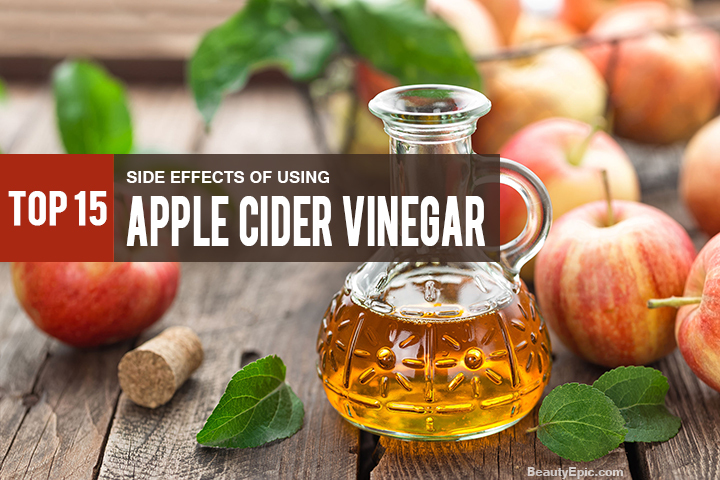 In this post, we would be enlightening you about the side effects of using apple cider vinegar. Though there is no doubt that ACV is good for our health, it would be better to know its side effects also so that you can use it accordingly. Consuming apple cider vinegar has known to lead to hypokalemia. This is caused due to decrease in the level of potassium in our body. The high acetic acid present in ACV can be one of the reasons for the low levels of potassium. There has been one known case where a woman was admitted in the hospital because of this reason. It was found that she had been consuming ACV diluted with water everyday for six years. It is advised that people suffering from uncontrollable blood sugar levels should avoid consuming apple cider vinegar. This is because it can cause an antiglycemic effect which means that there would be a decrease in the glucose levels. This drop in glucose levels can lead to other conditions like loss of consciousness and seizures. As mentioned earlier, apple cider vinegar has a high content of acetic acid. This leads to softening of your bones and also loss of bone density. People who consume large quantities of ACV have known to be suffering from osteoporosis. It can also affect the formation of new bones. Your oral health could be in danger if you drink too much of apple cider vinegar. Dental erosion and tooth decay are some of the problems that you would have to encounter. 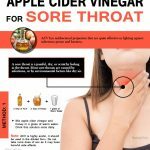 Though diluting the apple cider vinegar before consumption might help in keeping this problem at bay, it is advised that you consult your doctor before consuming it. Though it is often said that you can get rid of acne problems by using ACV, you also need to be warned that using ACV can also result in the formation of acne. This is because, when you consume ACV, it flushes out the toxins through your skin which can result in acne. You would have come across a lot of remedies where you have been advised to use ACV on your skin. But did you know that it can also cause skin burns? People, especially those who have a sensitive skin should not apply ACV on their skin. There have been numerous incidents where people have developed skin burns due to the usage of ACV. A lot of people are not aware that overuse of apple cider vinegar can result in headaches and nausea. This usually happens when your brain releases harmful toxins and detoxifies your body. By overusing apple cider vinegar, you are putting your tissues at risk. It does not matter whether you consume ACV in its liquid form or tablet form; using it without supervision will harm and corrode your body tissues. Gastroparesis is a condition that commonly occurs in people with type 1 diabetes. In this condition, the food that you consume does not get digested as per the normal rate. Instead it takes more time for the food to empty out of your stomach. Consuming apple cider vinegar can be one of the reasons for this condition. It delays the rate at which food leaves your stomach. Esophageal or throat burn as it is commonly caused can result due to the consumption of ACV. The main reason behind this symptom is the acetic acid content. Hence, it is very important to monitor the use of ACV especially in children. We are often advised to use apple cider vinegar as a detoxifying agent. But what we fail to realize is that during the detoxification process, there is a loss of lot of essential minerals as well. We have heard that ACV aids in weight loss process but it can also also cause indigestion and other digestion problems. Though consuming ACV gives you a feeling of fullness, it also leads to problems like diarrhea, heartburn, etc. If you are on some medication, then you need to consult with your doctor before consuming apple cider vinegar. This is because the ACV can interact with those medication and cause more harm than good for your health and body. If you are taking medications like insulin or medicines that stimulate insulin, digoxin, diuretic medications, etc., then it is advisable to avoid taking ACV. People suffering from blood clotting are advised to take medical consultation before consuming apple cider vinegar. This is because it acts as an anticoagulant or blood thinner and can lead to bleeding or hemorrhage. Since there is not adequate research done on whether drinking apple cider vinegar is beneficial or harmful for expectant mothers, it is best to completely avoid it during your pregnancy. You should also stay away from it during the breast-feeding phase. As they say, prevention is better than cure. So unless it is medically proved, pregnant women should avoid this tonic. After going through all the above mentioned side effects, we have determined that you need to keep two things in mind – firstly always consult your doctor on whether you can use ACV and secondly keep the dosage level minimum. Using it in the right dosage will maintain its status as a healthy tonic rather than a harmful drink! How to Use Apple Cider Vinegar for Scars? 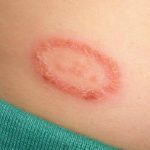 How Effective is Apple Cider Vinegar for Ringworm Treatment?